Last month I went to a special presentation about Parcel 4, the large Uptown lot we saved two years ago from becoming a parking lot and that Cultural Arts and Redevelopment staff are now working to turn into a public arts space. I promised afterward that I’d follow up with some images, and since Cultural Arts Manager Steven Huss was kind enough to send me images that were visible (unlike the ones in the staff report), I can now deliver on that promise. First, I’d like to detour a bit and say that I think the Oakland Cultural Arts department is awesome. While certain other city departments seem to be stuck in the 80s (or worse), Cultural Arts is on the cutting edge, sponsoring events like Uptown Unveiled and art projects like the light based art piece planned for the 18th Street alleyway entrance to the 19th Street BART station. 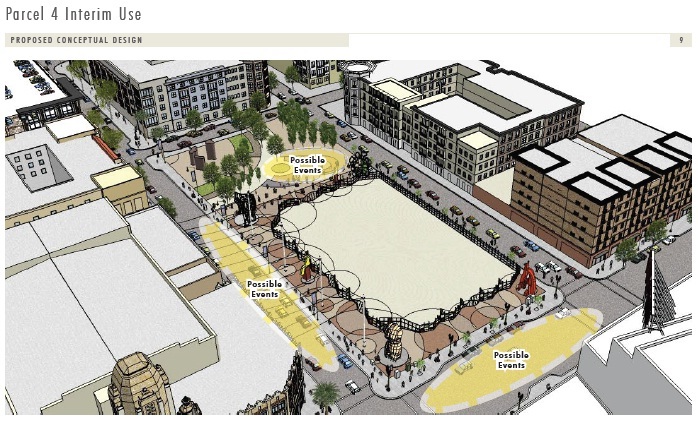 And their plans for Parcel 4 are equally exciting. To orient those not familiar with this parcel, it’s the large gated off space in between the Fox Theater and Uptown apartments, right next to an awesome little park (that sadly will soon be ruined by the Mario Chiodo sculpture “Remember Them”, but that’s another blog post). The Cultural Arts department applied for a $200,000 grant from the National Endowment for the Arts and received it, and the City is matching that with another $200K from funds already reserved for downtown art. Staff made it abundantly clear again and again that this is a temporary project – once the market rebounds, they will be looking for proposals to develop housing on the land. The NEA grant requires the art space to exist for at least four years and even when the market rebounds it will take quite some time to approve a project, so even though this space is temporary, it should be around for at least several years. The total budget for this project is $400K, which might sound like a lot, but for a lot this size, it’s really not. Besides funding, the other constraint is that the NEA grant requires Oakland to be finished with the art space and open it to the public by December of this year. If you’ve followed any City project (or for that matter any government project), you’ll know that this deadline creates a super tight schedule. The white area would remain undeveloped and fenced off and the darker area would be a public space for people to walk around and hang out. The circles represent where art would be placed. The larger circles represent larger, marquee pieces of art that would anchor the space, while smaller art pieces would be featured in between. At the special presentation on Parcel 4, multiple people were dismayed that the whole lot would not be developed, which is understandable, but staff made good arguments that do to budgetary and time constraints, this was what they could accomplish by December. And I definitely would prefer something to nothing. Still, some people had good ideas for developing the central area – seed it with native, low water plants, create a gravel based labyrinth inside, or let BRAF develop it. Staff were open to suggestions, but it will be important for the community to stay involved to ensure the middle space of the lot is developed. The yellow ovals on the streets in this diagram designate spaces that could be used for events, and you might notice that two of these spaces are generally used by cars. The idea is to close of 19th and/or Telegraph a couple of times a month for events, including the Art Murmur. I’m a huge fan of temporary street closures so am very excited about this potential use. Events would draw people to the area so they’d know about the awesome art that will be housed here. So what type of art will be featured in this space? Cultural Arts wants to continue on its light-based projects and is considering stringing lights between the art space and the Fox Theater over 19th street. This could look really neat and draw people in after dark. 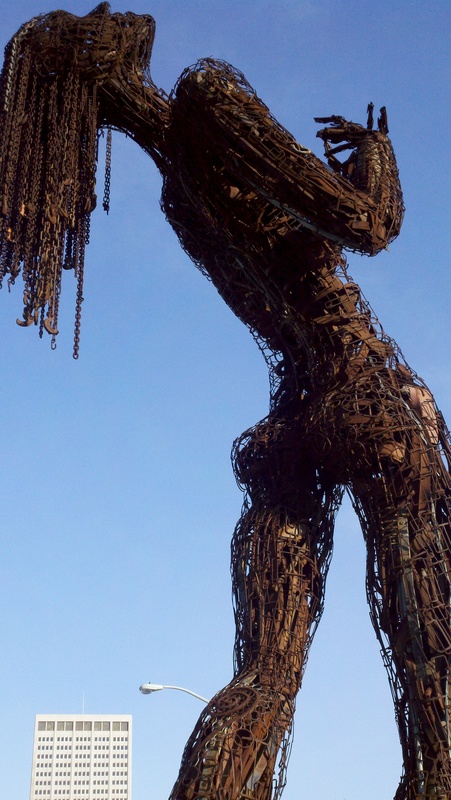 I was happy to hear that Oakland artists will be prioritized and that the City is working with Black Rock Arts Foundation (BRAF), which has funded tons of Burning Man-like art outside of Black Rock City, including many projects in San Francisco and other Bay Area cities. The sculpture on its own is awe-inspiring in its size and detail. It’s especially magical when it’s a bit windy, as the woman’s hair moves in the wind and makes beautiful sounds. 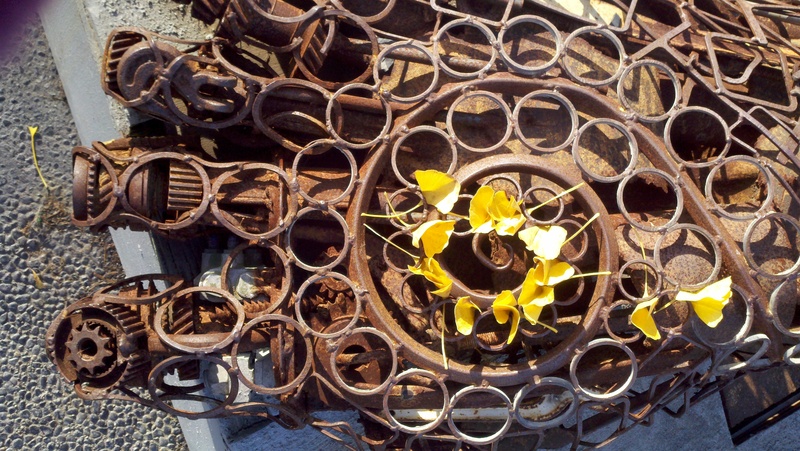 But the sculpture as an art piece that can be viewed is not the best part. The best part is that the sculpture and its accessible placement in the center of the park encourages participation and interaction. 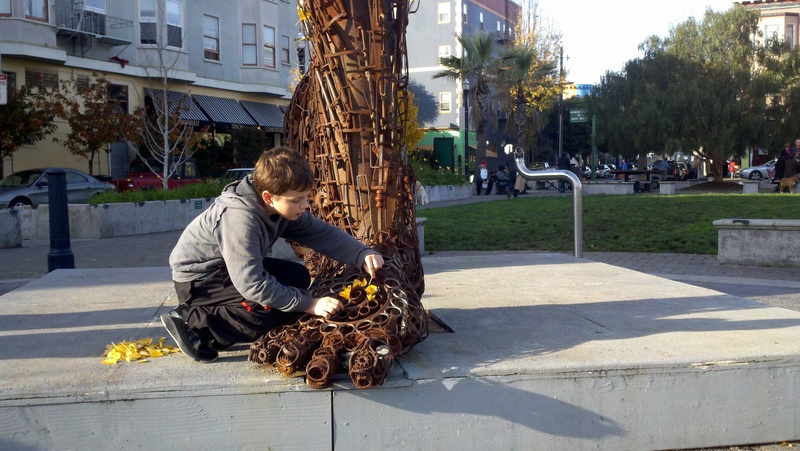 When my wife and I were there in December, she snapped some photos of a young boy who had collected a bunch of yellow leafs and meticulously added his own artwork to the sculpture. After he left, a young girl who had been watching him came over and placed a few additional leafs on the foot of the sculpture. The outcome was beautiful. It made me so happy to see these children interacting with the art piece and with each other. That’s the beauty of accessible art, a beauty I’ve seen so many times at Burning Man (which is the number one reason I go back every year) but so seldom see outside of it. Parcel 4 will be different from Hayes Green, both in how it’s arranged and because of its location. But I am hoping that like Hayes Green, the space and the art it houses will inspire interactivity, participation, and will make people smile as much as I did on that sunny day in December. Here here! Let’s make sure to present a positive creative plan for the terra icognita part of the lot, so that no one is tempted to put vehicle there, and to enhance the area with visual riches, even if they can’t make it fully accessible due to budget constraints. I am willing to donate wildflower seeds as needed. Yes! I think a park in the middle of downtown would do wonders for the neighborhood and the city in general. The temporary street closures is a wonderful idea and would make the space reminiscent of the large plazas that are quite common around the world. Screw the condos. Let’s develop the space for the people! Yes! 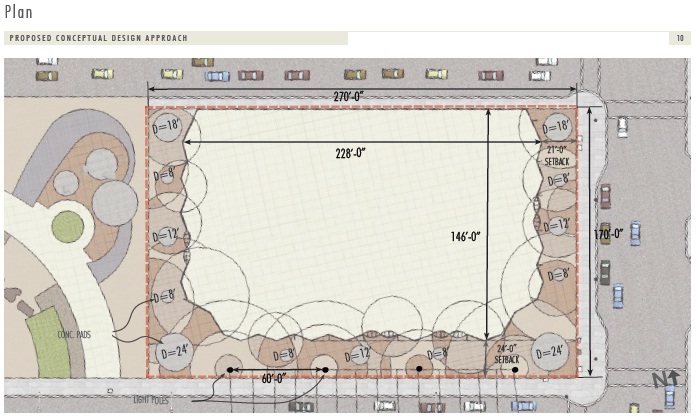 I am a resident in the neighborhood and we really need something like this … I am so excited to see this come to pass — I only wish the entire lot could be developed as a park! The planned placement of the art space would be a perfect “border” for a wonderful park area where people could hang out and enjoy the gorgeous architecture on the area! I would prefer to see the center area graded and just seeded with native grasses and wild flowers. It seems to me that this would be cheaper and more pleasing than plain gravel even it is is enclosed by a fence. A gated park that could be closed at night with lawn and simple benches, much like one sees in Europe would also be an improvement. How does one “get involved” in the development of the middle part?